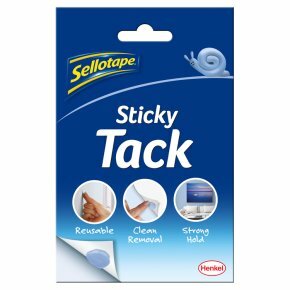 Reusable, clean removal, strong hold.Sellotape® prides itself on being the Nation's Favourite tape, and the family is just getting bigger... Our blue Sticky Tack mounts objects securely with a strong hold. It's easy to use, removable and reusable. Here are just few ideas: Repositionable - Hang decorations and greetings cards Reusable - Mount posters quickly and replace them easily Clean - Remove lint from clothes and upholstery As easy as 1,2,3! How to stick & mount: Remove small piece of tack from sheet. Work between fingers to soften. Apply to one surface to be bonded, mount and press down firmly. Note: apply to clean, dry surfaces. Removal not recommended for porous and delicate surfaces such as uncoated wallpapers and fibrous papers. Take care when removing the tack, particularly if it has been stuck down for a long time. Use a small piece of tack, particularly if it has been stuck down for a long time. Use a small piece of tack to remove remaining traces.